Argyle street has always baffled me. 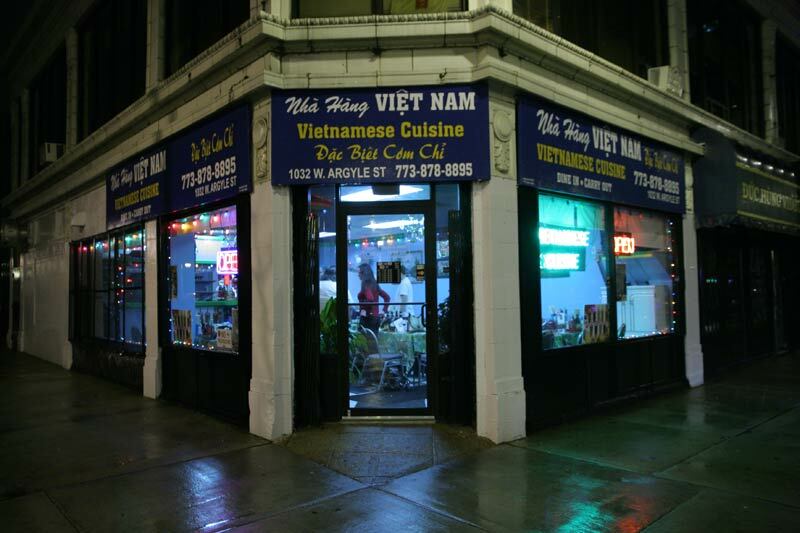 Why are there 10-15 Vietnamese restaurants lined up next to each other, yet most of them are nearly empty all the time? So a couple months ago, I set out with a team of LTHers to figure it out. What I discovered was a lot of restaurants that just weren't very good. Cold service, wilted herbs, and boring food were a common theme as we hunted around searching for a great bowl of pho. One star stood out from the crowd though for its focus on vibrant flavors and impeccable old world charm. That star is Nha Hang. My trips to Nha Hang have been eye opening. Vietnamese food relies heavily on fresh herbs, meaty broths, and funky sauces. Nha Hang hits all these notes effortlessly. For a simple example of their strengths look no further than their bowl of pho. The broth is thick and satisfying, the meats are tender and plentiful, and the herb plate is overflowing with fresh and crunchy herbs. I recently tried their Bun Bo Hue and it was easily the best rendition I've had. The broth is spicy and hearty, warming you from head to toe on a cold day. And the fishy, funky Bun Mam is one of my favorite soups in the city (pictured above). Nha Hang has an extensive menu, and I can't remember a miss in the bunch. 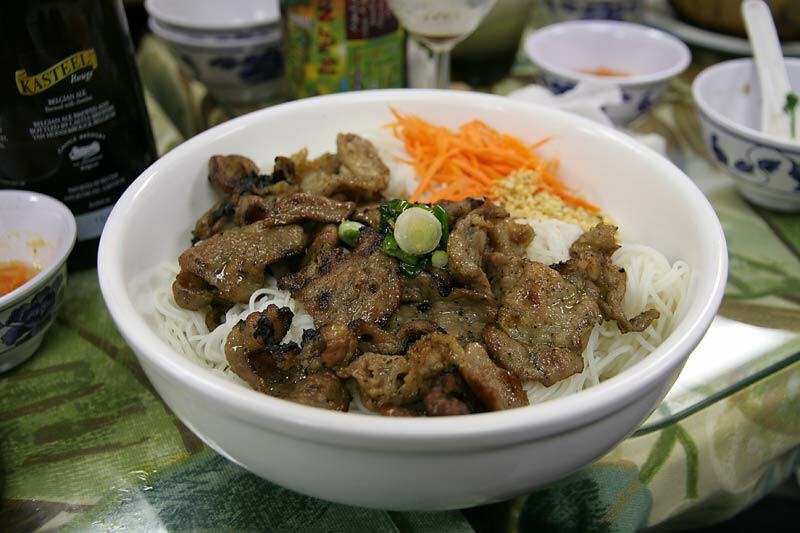 They succeed even on relatively simple dishes like the grilled pork over vermicelli pictured above. The pork is marinated in a sweet and umami sauce and grilled to bring out the rich flavors of the marinade. I can't believe how tasty this simple grilled pork can be. I also have to recommend the catfish claypot. I've ordered this a couple times at other restaurants in the past, and it was too sweet and mushy, not pleasant at all. Nha Hang gets it just right balancing the sweetness of the caramel sauce with the funk of fish sauce making for an interesting and complex dish. The catfish clay pot is just another of the many Vietnamese dishes I've never liked before I tried it at Nha Hang. The family that owns Nha Hang couldn't be warmer and friendlier. I've always been greeted with a bright smile and attentive service. 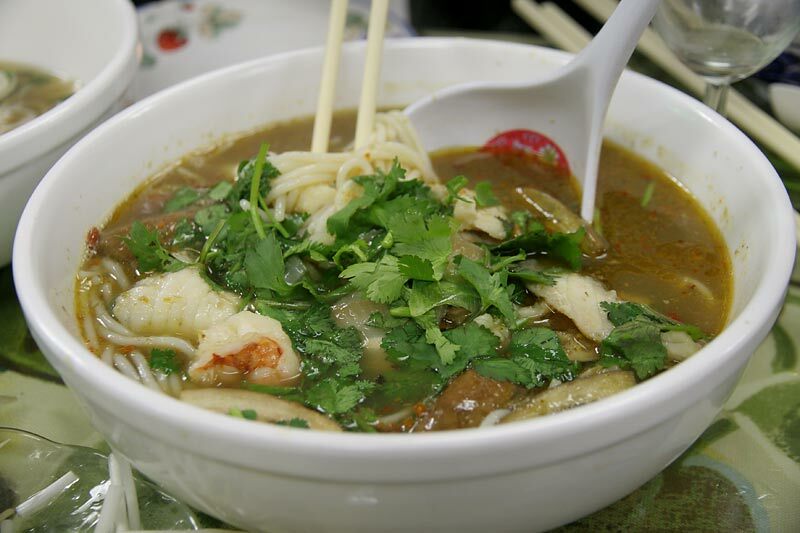 Nha Hang embodies everything that's great about ethnic cuisine. Interesting flavors, different cultures, and, of course, cheap and delicious food. I've recommended it to so many people and heard nothing but glowing reviews. Their legend has been steadily growing on LTHForum, since their standout performance on the pho crawl. What more can I say? I love the place. And I'm not alone. sweetbread: A friend and I went to Nha Hang yesterday on their recommendation. We were blown away. It was the best Vietnamese either of us have ever had...and though I haven't been to Vietnam, I lived in the heart of Boston's Vietnamese neighborhood for 3 years. 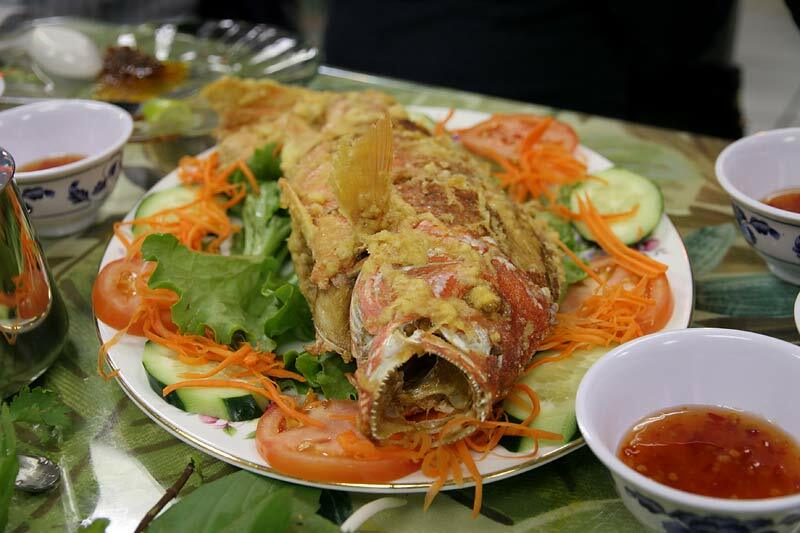 laikom: I had never had a Vietnamese meal that sold me on the cuisine as a whole. After tonight, I am a changed man. Vietnamese now ranks amongst my favorite cuisines, thanks to Nha Hang. 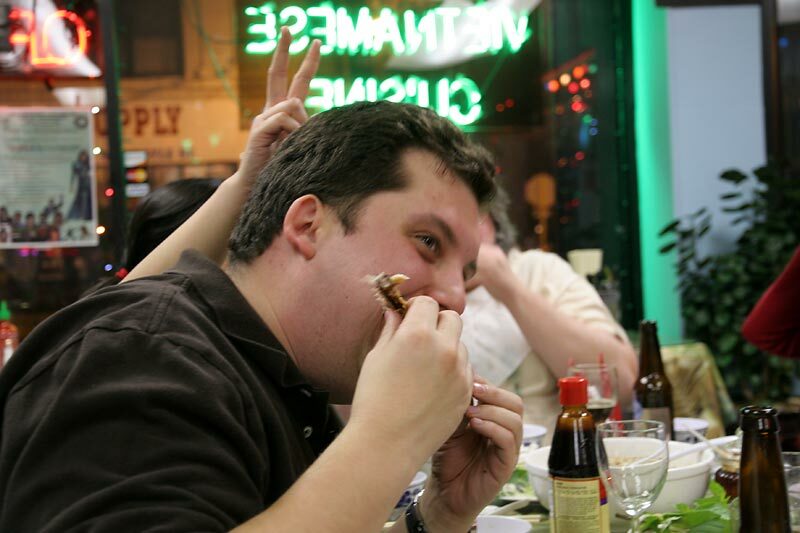 stevez: [I] can safely say that this dinner was among the best Vietnamese food I have ever had in Chicago. ronnie_suburban: . . . the food made sense to me. It wasn't course after course of overly sweet, unbalanced dishes. Instead, tasty, fresh ingredients were combined in distinctive, complexly-flavored preparations that still allowed the individual components to shine. kl1191: I was happy with my meal and am looking forward to going back to try more of the menu. The wings were outstanding. In addition to the salty/sour tang, they had a sweet pineapple note to go along with greater than expected chile heat. Last edited by turkob on March 11th, 2012, 12:58 pm, edited 2 times in total. Even though I've only eaten here once and was somewhat lukewarm about the food, I'm going to get behind this one on principles alone. When I first discovered LTH and the GNR program I was delighted to find a wealth of off- the- beaten path recommendations to explore enlightening cuisines made with care by dedicated proprietors. This was a site where individual poster's intrepid research and discoveries existed as a collective resource unlike any media outlet. As a democratic platform, this program will develop with its constituency, which is great, but to my eyes it seems that the tastes here are moving more towards the mainstream, big name restaurants that open with fanfare in all the major food columns. Back to Nha Hang. As I mentioned the food did not wow me on one visit. Chicken wings- great seasoning, maybe not the highest quality bird though. Duck salad pretty great, though the shrimp crackers were more impressive (really, really impressive at that) than the duck. The claypot pork belly and catfish dish was a new taste sensation, rich and caramely with an unmistakable Chinese celery note and I loved the pickles, though the entirety of the flavor set was not something I will crave. The lauded Bun mam fell shortest for me, primarily since it was served just a notch above lukewarm and the noodles were sogged out. No matter though, I still really enjoyed my experience, its clearly a family affair- a delightful and attentive staff. The room is all sorts of cute, love the interior/exterior faux courtyard vibe and all the day glow tchotchkes. This, in my mind, is what an archetypal GNR should look like. And a place that I could only discover here, just like a lot of my other favorite spots that I was led to by the glorious database that is LTH, places like Khan, Zaragoza's, Nhu Lan, and Aroy Thai. Having just spent a week in Vietnam earlier this month, I wasn't sure if I'd view Nha Hang the same when I returned home. The truth is I don’t, I appreciate it even more! While in vietnam, with a few favorites in mind from Nha Hang, I made it a goal to seek them out in Vietnam, which only led to disappointment. Nha Hang is the real deal. I guess I shouldn’t be surprised, the family who runs the place clearly loves what they do, and do it authentically because they wouldn’t have the first clue how to dumb anything down. Having eaten here 6 or more times now, I can easily say that the food here always one-ups itself on each subsequent visit. I was tempted to get the same hotpot we had during the first LTH event because it was so good. I fought the temptation and was rewarded immensely by trying something new when I discovered the Lao De (goat) hotpot. The place has an impressively extensive menu, given the size (about 10 tables). The sheer number and variety of dishes LTH has reported as being not simply good, but great, I cannot agree more with this nomination. As far as being a great NEIGHBORHOOD restaurant, I really am not sure there is a better fit. Considering the family who runs the place speaks little English, it’s amazing how they make you feel so at home! They are such a wonderful and warm family, and it shows in both their hospitality and the food! There is no more perfect GNR! A huge "yes" to this nomination!! I crave Nha Hang and only wish I could get there more frequently. A few of us are planning to go for dinner on Thursday 3/15 and would welcome additional ordering power if anyone would like to join us. Just PM if you'd like to meet there. We haven't decided on a time yet but we are flexible if anyone has a preference. Did you see the event I'm planning this Thursday? Not sure if you were referring to that or not. HA! Great minds think alike I made a plan with petite_gourmande and one of my non-LTH friends to go and didn't see this til after!! Happy to join yours if there are spots--going to go sign up now!! This morning, Mrs. EdB60035 and I decided to make the trek to Argyle (I can get to the loop faster, sigh). She did a google search "lthforum argyle" and found the thread for Nha Hang. I even overshot Broadway and ended up driving north on Kenmore, parking just short of Argyle. It seemed like it was our destiny today to try Nha Hang. There were only a few tables occupied, and throughout lunchtime we were the only "round eyes" in the place. They didn't seem to quite know what to make of us, Once we sat down to order, I pulled out the iPhone to look up what exactly the LTHer recommendations were, and voila, here was this nomination. The menu is almost overwhelming , but we successfully sampled everything from a crunchy banh xeo to a banh mi with beautiful bread to the LTH-recommended rare beef and bún mám. Had never had that particular soup before and it was complex and delicious. The staff/owners seemed very interested in how we were enjoying lunch, and I had no sense of them dumbing anything down for us. It was much much busier at our usual Tank Noodle down the street, but I think that made the Nha Hang experience all the better for us. It wasn't assembly line like we normally get on Argyle Street, it was a personal experience. Seems to fit the GNR criteria to me. I live a couple blocks north of this place and am a frequent solo diner. They serving hands down the best food on argyle right now and I can't agree enough with all comments regarding the kind owners. This place is everything a GNR should be. Also i'd love to partcipate in any group dinners here in the future, my ordering power is always so limited. An excellent nomination. Every time my family has visited, we immediately feel at home and warmly welcomed by everyone - including by that large fish in the aquarium, who has more personality than most of us and actually seems eager to interact with my two little daughters (they refer to Nha Hang as "The Fish Restaurant"). Given the Chicago area's relatively small Vietnamese (and Vietnamese-born Chinese) population, there is admittedly rather modest competition here (as compared to Orange County, San Jose, Northern Virginia, or Houston). But our meals at Nha Hang have consistently been among the best Vietnamese food we've found in this area. I've only been once and really enjoyed it. The place seems like a quintessential GNR, especially the owners, who could not be nicer or more proud of the food they're putting out. I've only been to Nha Hang twice, but those two meals are the best Vietnamese I've had in Chicago in the past year. While I wish I'd visited a few more times and that the place had a longer track record, put me down for yes to a GNR. The food is solid and the staff couldn't be friendlier. Jefe wrote: Even though I've only eaten here once and was somewhat lukewarm about the food, I'm going to get behind this one on principles alone. When I first discovered LTH and the GNR program I was delighted to find a wealth of off- the- beaten path recommendations to explore enlightening cuisines made with care by dedicated proprietors. This was a site where individual poster's intrepid research and discoveries existed as a collective resource unlike any media outlet. As a democratic platform, this program will develop with its constituency, which is great, but to my eyes it seems that the tastes here are moving more towards the mainstream, big name restaurants that open with fanfare in all the major food columns. I could not have said this better myself, thank you, I know that I am sometimes part of the trend away from off the beaten path restaurants and I need to remedy that. I found Nha Hang because of laikom and turkob's search for pho and have been amazed at the food I've had so far. The rare beef salad, claypot pork belly and catfish, the Bun Mam and the frog legs are all in my rotation. What really warms my heart is the kindness of the owners, young Tutu coming in from school, the fish tank. all the little things that make me feel like I'm having dinner in some ones home. I vote a big thumbs up for Nha Hang and for those of you who have not yet tried it, be adventurous and make some new friends. Had a late lunch here today -- saw that they were setting up for the LTH dinner. I am not an expert on pho, although I did my own mini-pho-athon when I first discovered pho a few years ago -- probably had pho from six different restaurants in two weeks to learn what I was looking for and seek the best (and numerous different locations since then). But in my opinion, Nha Hang has the best pho I have ever tasted. Just what the Argyle pho-athon people said -- the broth is just significantly more deeply flavored with beef, perfect nuances of spice, absolutely the freshest bean sprouts, basil and sawtooth that I have ever been served. This place is terrific, and should definitely be a GNR. I don't know if I will be able to eat pho anywhere else (all right, well, I'll eat a bowl of pho any time it is put in front of me, but I will always be comparing it to Nha Hang). Thank you to the people who spent three evenings discovering this place. Only been once for a quick lunch and have not sampled much of the menu, but what I've tried made me want to go back ASAP. As has been noted, the friendly quotient at Nha Hang is high. Based on last night's outstanding LTH dinner and one prior meal, I am completely behind this nomination. Really outstanding Vietnamese soups plus a treasure trove of other dishes and exceptionally warm service. Love this place! After my inaugural trip to this Argyle Street spa, I will weigh in with a hearty "yes" to GNR status. Junior has a buddy at school who is Vietnamese, and he said he was interested in trying the food. I remembered that, sadly, he had not cared for the lemongrass banh mi at Nhu Lan, so I decided to give Nha Hang a whirl, since some concern had been expressed on this board regarding its customer volume. There were three tables besides ours for a late lunch on a Saturday, which didn't seem too bad. Not surprisingly, Junior's favorite part of the meal was the mango smoothie with tapioca pearls. But he also liked the pho with flank steak. I am not a pho phanatic, but the complex broth was impressive -- sweet, sour, salty, and umami all competing for attention. I also ordered wide rice noodles with pork and vegetables as a backup in case the kid didn't like the soup, which wasn't the case. So I ate the noodles myself and was impressed by the high-quality black pepper that distinguished the dish from the relatively pepper-free versions one gets at a Cantonese place, although I prefer the best of the latter. Moms was nice about cooking the noodles long enough for some crispiness. There is a bit of a language barrier here. I had to ask for shrimp spring rolls twice. (They were a good version.) But the easy-to-understand and comprehensive menus make ordering simple enough. On warm days, wear light clothing to this restaurant. Like so many other modest operations, the a/c goes only so far. A very nice touch was the complimentary dessert -- a slushy lime beverage with fresh lychee. The lychees were especially yummy. I tried to explain to the husband-and-wife owners that they have many friends at LTH Forum. There was a younger lady there, maybe a daughter, who seemed to understand the concept of an Internet foodie site and was interested. I hope a well-deserved certificate lies in the family's near future. I don't often feel qualified to speak up in the GNR discussion but Nha Hang is so deserving, I need to break my silence. This is a classic Great Neighborhood Restaurant. I've been twice (thanks to LTHForum) and if there was ever a dead ringer, this is it. Totally unpretentious and language barriers aside, visits to Nha Hang are like little adventures. The menu descriptions are vague but you know it's going to be good. The owner is animated, the decor is diverse, the soup greens overflow their plate and the chicken wings are sticky and sweet. I've never been to Vietnam but thanks to Nha Hang, I feel justified in putting off a visit. Not much to add. This is the best Vietnamese food I've had in Chicago. We should really just pick up Tank's GNR and move it here. Thanks to turkbob and laikom for introducing me to Nha Hang. My first visit to Nha Hang was the December 2011 LTH dinner, and I was really blown away, not only by the flavors of everything I tasted, but also by the distinctness of the menu. So many of the items we tried that night were ones I have not seen at other Vietnamese places in town. I'm since returned twice with friends who have become equally fond of Nha Hang. And how could you not? Truly gracious service, less ordinarily seen menu items, and delicious food that's very well prepared. If you want to experience crazed reactions from every taste bud in your mouth, in a way that only great Southeast Asian food can deliver, this place is for you. Now I'm not as down on Tank as some are. In fact, I had a terrific bowl of pho there last week, including some leftovers featuring a wonderfully gelatinous broth. 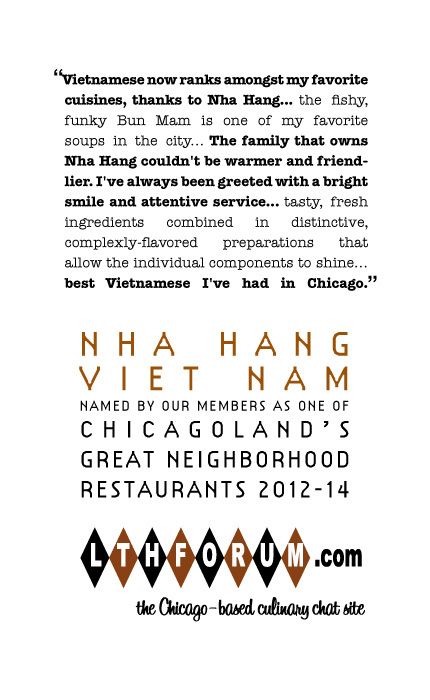 But my point in bringing this up is that I believe Nha Hang does and should stand on its own as a nominee, and its standing as a GNR is based on how deserving it is of this nomination, and not at all on one's disappointment with other Vietnamese places in Chicago. Nha Hang is a most welcome addition to Argyle Street and most definitely a GNR. This, along with Cho Jung and La Chaparrita, are the nominations that I'm happiest to see this time around. I enjoy many of the other places too, but Pleasant House, Owen & Engine, etc. aren't having any trouble getting press. Unassuming little out-of-the-way spots like this one, on the other hand, could benefit from any added exposure they can get. Not to mention that this is in a very real sense an LTHForum discovery (thanks to laikom and turkob's explorations). Anyway, I've eaten here over half a dozen times now and have never failed to be impressed by 1) the care taken with the preparation of the food; 2) the charm of the proprietors, always impossibly cheerful despite 3) WHERE THE HELL IS EVERYONE ELSE??? Plus the jasmine tea in that little glass is tops. This is what GNR is all about. The people can't be any nicer, and with the steady decline in quality at Tank, I can't thank Laikom and Turkob enough for introducing me to this place. Very nicely satisfies my cravings for home cooking.